Lucile Wheeler opened the modern era of ski racing for Canada when she won their first Olympic medal, a bronze medal in the Women’s Downhill race of 1956 at Cortina, Italy. During the years of 1958 through 1960, Lucile and teammate, Anne Heggtveit, combined to dominate women’s skiing by winning four of the eight available gold medals in F.I.S. World Championship competition. This was a formidable feat for Canada. Because of Lucile’s training and competitive methods, a format was adopted in Canada which led to later Olympic and F.I.S. Medals and the World Cup for Nancy Greene and F.I.S. Medals for Betsy Clifford and Jim Hunter. Lucile’s pioneering ski record remains an inspiration for today’s Canadian National Ski Team. Born in Montreal on January 14, 1935, Lucile first used skis at the age of two, carrying messages from her home in St. Jovite over the three-quarter-mile snow route leading to a resort operated by her father. She entered her first competition at age 10, a downhill race at Mt. Tremblant in which she placed seventh among 21 senior ladies. Two years later, Lucile was promoted to Class “B”, became the Junior Downhill and Combined Champion of Canada and was named to the ladies’ team for the International Meet at Lake Placid, New York, an annual series from which emerged a format for the current Can-Am racing circuit. The following year Lucile continued her winning ways in local races: first in the Ste. Agathe Slalom, first in the Taschereau among seniors and juniors, first junior in the Canadian National Downhill and second in the Quebec Kandahar. In 1950, at the age of 15, Lucile again was a top performer and named to the Canadian Ski Team for the F.I.S. World Championships in Aspen, Colorado but did not compete due to age and school. Next she participated in her first Olympic Winter Games in 1952 in Norway and raced the balance of the season in Europe. In 1953, Lucile remained in North America, winning first place in the Ryan Cup at Tremblant, competing in the Quebec Kandahar, the Canadian National Championships, the Harriman Cup at Sun Valley, the United States Nationals and the North American Championships. She returned to Europe in 1954 and gained valuable experience. 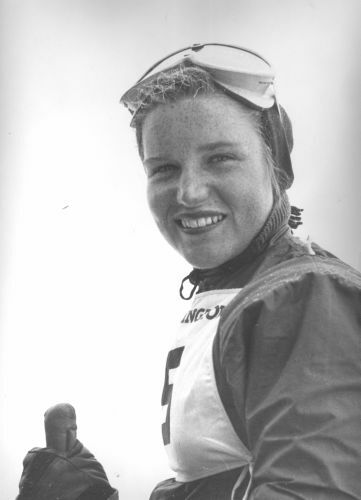 In 1955, Lucile placed second in the Ryan Cup, won the Alpine Combined of the Canadian Nationals and again took part in the Harriman Cup and other competitions in the United States. One week prior to the 1956 Olympics, Lucile placed second at Kitzbuhel, Austria. She followed this up with a spectacular run to capture the bronze medal in the downhill of the VII Olympic Winter Games at Cortina, Italy – the first North American to win an Olympic Medal in the downhill. Her 1957 European record included 1st place in the Hahnenkammen Kitzbuehel, Austria, high spots in other international competitions and she was named by the F.I.S. as one of the three top women skiers in the world. In the 1958 World Championships at Bad Gastein, Austria Lucile won two gold medals: the downhill and the giant slalom. She was also runner-up in the alpine combined. Lucile’s ski racing career was encouraged by her parents, Mr. and Mrs. Harry Wheeler. Her elementary education was provided first by a tutor in St Jovite, then three years at St. Mary’s in Littleton, New Hampshire and then to passing entrance examinations for McGill University. Her sports hobbies included riding, golf, swimming, tennis and fishing. Lucile is a ski ambassador of whom all Canada and North America are proud. She remains active as a leader in development of young racers in Quebec’s Eastern Townships and an idol to all who know her. She is a proud holder of the prestigious Order of Canada. Lucile married Kaye Vaughan in 1960. He played CFL Football. The Vaughan’s have one daughter, one son who also played CFL Football and five grandchildren. Lucile Wheeler Vaughan was elected to the U.S. National Ski Hall of Fame in 1976. If you notice any errors or inconsistencies in Lucile Wheeler Vaughn's bio, click here to let us know.